The Intercultural Affairs office at Seaver College will host Loqui: A Celebration of Diversity and Inclusive Excellence at Smothers Theatre in Malibu on Friday, April 27, at 1 PM. The annual event, held one day before the Seaver College commencement ceremony, honors the soon-to-be graduates as well as distinct cultures that shape the Pepperdine experience and deepen the community's collective sense of belonging. “Reflection is good for the soul. 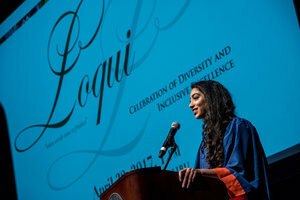 Loqui is Latin for ‘when words come to fruition.’ We set aside this time to reflect and celebrate the work that God has brought to fruition in the lives of our graduating seniors and the Pepperdine community, specifically through the lens of diversity, equity, and inclusion for the 2017-18 school year,” explained David L. Humphrey Jr., associate dean of student affairs for diversity and inclusion at Pepperdine University. Helen Easterling Williams, dean of the Pepperdine Graduate School of Education and Psychology, will be the guest speaker at the Loqui celebration this year. Additionally, the Bowers, Davis, and Todd Award for Leadership in Diversity and Inclusive Excellence will be presented to two graduating seniors who have demonstrated an active commitment to advancing institutional diversity and inclusive excellence as part of their spiritual journey. For additional information about Loqui, visit the Seaver College website.